Since 1971, Robert Mondavi Winery’s Cabernet Sauvignon Reserve has been one of California’s most renowned red wines, and it’s better today than ever as it now comes entirely from the extraordinary To Kalon vineyard in Oakville. But how many consumers have tasted Mondavi’s remarkable Fumé Blanc from the I Block of the same sprawling vineyard? During my double vertical tasting of both of these special bottlings in March, it was the white wine that hit me like lightning. 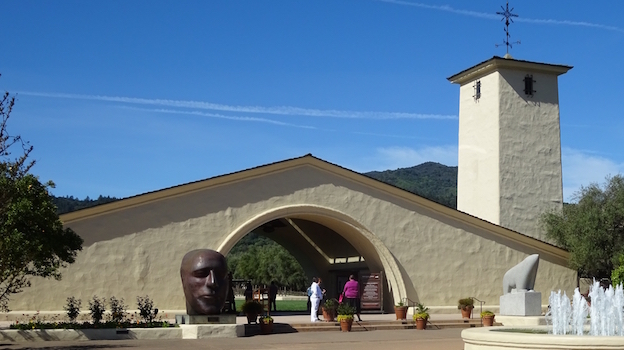 Founded in 1966, the iconic Robert Mondavi Winery celebrates its 50th anniversary this year. The owner of a major chunk (450 acres) of what is arguably this country’s most fabled vineyard, Mondavi produces its finest bottles from its acreage in To Kalon, which stretches from Highway 29 to the western hills of Oakville. To Kalon, Greek for “the beautiful,” is classic benchland on an alluvial fan sloping down from the Mayacamas mountains. The soils close to the base of the hills are light, gravelly and especially fast-draining, while finer loam deposits, including varying amounts of clay, have accumulated over the eons as To Kalon slopes gently toward Highway 29. Although more than 400 varieties have reportedly been planted in this vineyard through the years, it’s widely considered to be best for Bordeaux grapes, including Sauvignon Blanc. Robert Mondavi Winery is the largest owner of To Kalon (the vineyard was founded in 1868 by Henry Walker Crabb and then enlarged when Crabb bought more adjacent land in 1881); the Beckstoffer family and Opus One own 89 and 83 acres, respectively. The boundaries of To Kalon have shifted during the years, sometimes owing to legal proceedings, and have also expanded, mostly toward the south and to the hills to the west, beyond the 359 acres originally owned and worked by Crabb. Mondavi’s eminently ageworthy To Kalon I Block Fumé Blanc, from what are probably the oldest Sauvignon Blanc vines in North America, will require a special effort to taste, as annual production is around 200 cases and the wine is rarely available outside the winery and a few elite restaurants. The vineyard was planted in 1945 on phylloxera-resistant St. George rootstock. The head-trained vines in this five-acre block are never irrigated and the crop level produced by these old soldiers is routinely under a ton per acre. From its first vintage, 1992, the wine has always been 100% Sauvignon Blanc, but it is an uncommonly opulent and complex Sauvignon owing to the very low yield and the quality of the site, which sits on well-drained gravelly loam soil with a lot of rocks at the foot of the mountains. I Block is normally picked in three or four passes over a period of three to eight days, between mid-August and the first week of September, and the clusters go direct to press, with no skin contact, in order to preserve elegance. The must settles overnight and is then fermented in French oak barriques, between 25% and 40% new but none more than three years old. As of the 2000 vintage, Mondavi has worked with green juice, as opposed to brown. Dry ice and a blanket of CO2 are used to protect the must, and it’s quite pale in color when it goes into the barrels. The wine is essentially made from free-run juice, although a small percentage of the separate press portion, which is treated differently to minimize phenolic character, may also be included. At any point during the aging process, barrels may be declassified into Mondavi’s To Kalon Fumé Blanc Reserve (the 1986 release of this bottling was actually the first Mondavi wine to be labeled To Kalon), of which about 2,000 cases are produced annually. Twice-weekly batonnage is carried out for the first six to eight weeks after the fermentation, after which the lees are stirred once a week—“to untighten the wine,” which has a low pH and strong acidity, according to long-time winemaker Geneviève Janssens, who has been at Mondavi since 1997 and succeeded Tim Mondavi as director of winemaking in 2005. The wine remains in the same barrels, unracked, from the fermentation until shortly before it’s assembled for bottling, which takes place during the second July or August after the harvest. Far better known to wine collectors is Mondavi’s Cabernet Sauvignon Reserve, as this consistently excellent wine has been made in much greater quantities than the I Block Fumé Blanc: as many as 20,000 to 25,000 cases in the late ’90s, before many vineyard blocks were replanted due to phylloxera, and normally between 7,000 and 9,000 cases since the turn of the century. Its inaugural vintage was 1971, and through the ’80s and ’90s the wine was a vineyard selection made from what Robert Mondavi considered to be the winery’s best blocks, chief among them To Kalon but also including Mondavi’s large Wappo Hill vineyard in Stags Leap (prior to 1971, Mondavi’s top Cabernet bottling merely indicated “unfined” on the label, rather than “reserve”). Beginning with the 2011 release, the wine has been labeled Reserve To Kalon Vineyard, as the fruit now comes entirely from To Kalon. Through the years, the wine has featured small quantities of other Bordeaux varieties, typically Cabernet Franc and Merlot in the early years and Cab Franc and Petit Verdot more recently. Janssens presented the wines for this extensive tasting in three flights, beginning with the youngest bottles. The first flight, extending back to 2002, represented the “modern era,” she told me. Since that vintage the winery has done longer skin contact (35 to 42 days in recent years, compared to as little as 6 or 7 during the ’60s, ’70s and early ’80s) and has made more use of pumpovers and rack-and-return, as well as included a higher percentage of the press wine. And since 2002 Mondavi has always harvested based on maturity of flavors more than on potential alcohol levels in the grapes. Vintage 2000 was the first year the wine was made in Mondavi’s large Taransaud oak fermenters; that same year, Mondavi began using a sorting table. Since then, the Cabernet Reserve has always been aged for 18 to 20 months (in the early years it spent 30 months in barrel). The Cabernet Reserve has traditionally been aged in 100% or nearly 100% new oak. Mondavi now uses what Janssens described as “a classic blend of Bordeaux barrels,” purchased from a smaller number of suppliers than in the past. Brix levels in the grapes have generally increased one degree per decade, Janssens told me, adding that wines in recent years have been bottled with between 14.8% and 15.2% alcohol. Still, she has never acidified the To Kalon fruit that goes into the Reserve bottling, mostly owing to the fact that it comes primarily from well-drained, lighter, rockier portions of the vineyard. Janssens has not fined the Reserve Cabernet since 1999 but she continues to filter it in order to avoid brettanomyces. The wine is made from “an evolving choice of blocks,” often according to age of vines, but the densely planted Monastery block, located at the base of the hills, has been the core of the wine for a long time. My vertical tasting took place at Robert Mondavi Winery in March.